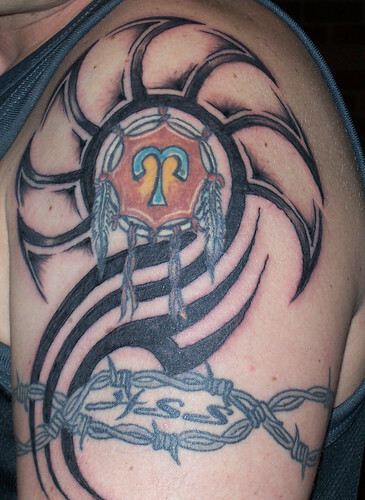 The tattoo symbols & designs on this page are the 12 classical signs of the Greek /Roman Zodiac. Mankind has been fascinated by the zodiac for millennia, since we first connected the dots between stars and named the constellations. There’s a real romanticism and magnetism to the idea that our lives and actions are all influenced by the celestial heavens. It’s no wonder then that zodiac tattoo designs abound. Not just in America, but around the world. Nearly every single culture has their own version of the zodiac, and there are many different names for astrology around the globe. However, the zodiac form most popular in the United States, in horoscopes, star charts and general conversation is the Greek/Roman zodiac, which is broken down into 12 different signs, each one representing a roughly one month period. Each "sign" has its own meaning, and people who fall under the same sign of the zodiac generally share common traits, weakness and strengths. If you’re considering getting a zodiac tattoo design, here is a little more information on the 12 different signs of the zodiac to give you an idea of their meaning.